So this year for Valentine's Day, Jonathan and I played it pretty low-key. We woke up, had breakfast, and headed out to play in some snow. There have been a bunch of snowstorms in the Bay Area lately, so we figured it would be a good time. Jonathan had mapped out a few places, so after packing changes of clothes and some snacks, we bundled up and headed out. We drove toward San Jose, and then up onto Road 130. We wound through the mountain for about eight miles when our plan was foiled. Two police cars were in the road, and it was closed to non-local traffic. We were forced to turn around near Joseph D. Grant County Park. We considered stopping there to play, but there was a sign noting that there was no snow there. So, we drove back down the mountain and stopped by the house for lunch an d to re-group. Jonathan had a back-up plan, unfortunately it was using the same road we couldn't travel, so we needed a new idea. So we changed directions and drove toward Redwood City. 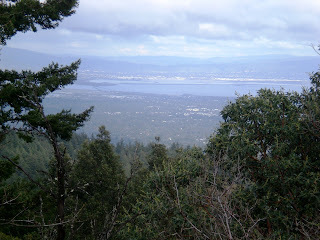 We took King's Mountain Road up all the way to Skyline Blvd in Woodside, CA. There had been reports in the area, and we watched the thermometer drop from 50 to 39 over the course of the drive. 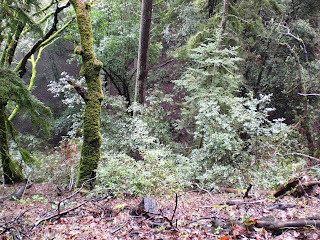 We ended up being 2,180 feet up (give or take) when it seemed like we weren't going to find snow. We saw a sign for Wunderlich County Park and gave it a try. 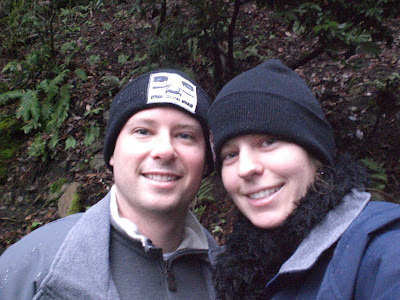 We put on our ski jackets and hats (and I wore my black scarf and brown snowboots) and headed into the park. There was no parking, so we were lucky to grab one of two nearby spots. On our way into the park, we both noted the mixture of rain and flurries that fell, and it was great to feel a snowflake on my face for the first time in seven years. 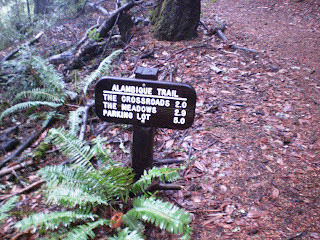 We were at a trailhead for about 6 different trails. 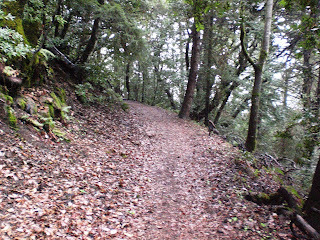 We started hiking on one of them, despite the wet leaves and dirt everywhere. After about twenty minutes, the weather started getting bad so we turned back after snapping a few pics. It was a good thing, because on the way back it began to storm. We headed down the other side of the mountain and returned home from the south.